'...colour is a power which directly influences the soul. Colour is the keyboard, the eyes are the hammers, the soul is the piano with many strings. The artist is the hand which plays, touching one key or another, to cause vibrations in the soul'. In 1911, Kandinsky wrote his essay 'Concerning the Spiritual in Art' in which he proposed that as well as charming the eye, colour also moves the soul. For Kandinsky, letting the eye wander over a palette laid out with colours created a myriad of physical sensations which gave rise to a chain of deeper psychic experiences. The stirring of the soul occurs because colours are powerful; each has its own characteristic and creates its own emotions and associations. Taking a line from his text as its title, this exhibition not only explores the use of individual colours in contemporary art but also turns the gallery into a walk-in colour wheel. Comprising the work of 10 artists, each work of art in the exhibition is dominated by a single colour and they are arranged sequentially according to the colour wheel. 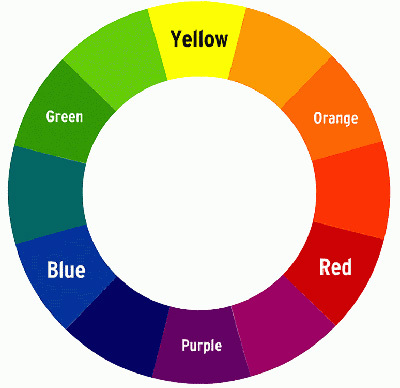 The development of the colour wheel or circle can be dated to the 17th century. The work of Sir Isaac Newton established the spectrum of light -the rainbow- as the standard colour chart and as well as identifying individual colours, also acknowledged relationships between them. Newton isolated seven spectral colours but repeatedly changed his mind during the course of his career and only opted for the seven-colour version because he was anxious to sustain an analogy with the musical octave. And so we return to the correlation of colour with musical notation: if colour is the keyboard each individual colour contributes a specific pitch and tonal richness to our visual experience. Each work in this exhibition has used a particular colour to express a mood, sensation or meaning. Echoing Kandinsky's belief that colour vibrates the soul, Alan Davie regards painting as akin to music making; using orange he creates vibrations across the canvas. Washes of red and burgundy create depth and express deep felt emotions in the work of Albert Irvin, while Lucy Stein uses a lurid colour pallet to express the chaos and confusion of contemporary life. Kandinsky suggested that cobalt green was a hard colour but Carolina Antich uses it to create a watery dreamscape. We might also wonder how our culturally established understandings of colour impacts on our interpretation of images. Would the resplendent golden robes of Bishop Mercurius, photographed by Andres Serrano, have the same power and authority if they were blue or violet? In the downstairs gallery is an exhibition of figure studies on paper. Each study presents the human form in a different way and collectively they demonstrate the various approaches to figuration that artists have taken since the 1940s.